These first weeks of 2017 have been spent poring over various laws, rules, conference minutes, and other information to distill down into a readable form, the current appellations in the Republic of Georgia. This is all for the forthcoming Georgian wine book that you can order now. But as something of a preview, below the is the initial introduction to this nest of appellations. Georgia was able to emerge from the Soviet Era with a number of appellations for their wines that stretched across the country. For the most part, they still are in modern use and stretch from east to west in a vinous arc. They work in a similar fashion to those found in Western Europe wherein they regulate the production of wine as well as implementing protection for the brands of the regions they cover. They are however a very, very curious collection. The oldest is from 1886 and the newest among them were created while Georgia was still part of the USSR, giving a grand total of 18. 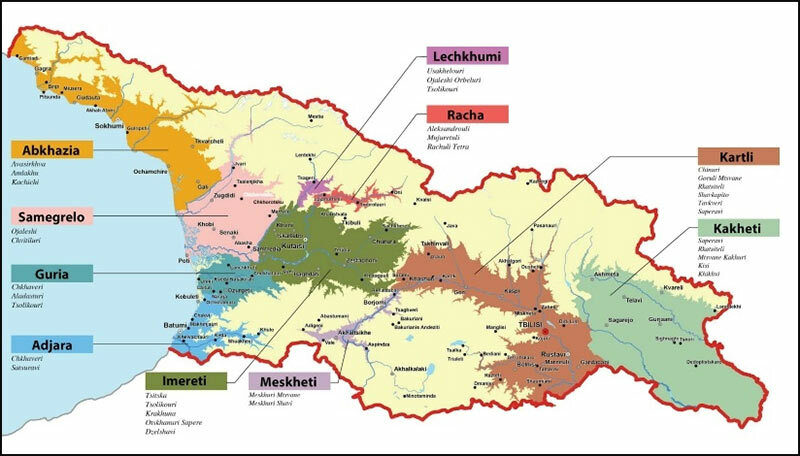 Taking in to account Georgia’s size, this may seem like a decent framework to break down the country regionally except that 13 of these 18 are demarcating zones in the eastern region of Kakheti. There are 12 for dry wines (maximum 4g/l of residual sugar), one for fortified wines, one for sparkling, and then four for semi sweet (between 30-50g/l of residual sugar.) Currently they are: Khvanchkara, Tvishi, Sviri, Ateni, Kakheti, Tibaani, Kardenakhi, Kotekhi, Akhasheni, Mukusani, Vazisubani, Gurjaani, Teliani, Tsinandali, Kvareli, Kindzmarauli, Napareuli, and Manavi. This rather diverse group is overseen by Georgia’s trademark and patent office, Sakpatenti and has been in force, within Georgia ever since 1998 with a massive revision in 2003. Unfortunately, due to not being part of the Madrid Agreement upon independence this has meant that rather than researching and defining new appellations, they’ve been playing a lot of catch-up in terms of protecting the ones they already have. This work is ongoing and even to this day, imitations of their quite famous (in former Soviet countries anyways) semi sweet wines from Khvanchkara can be found although they’ve made a lot of progress in putting a stop to this. Hopefully in the future, new and more tighter-defined appellations will emerge that also take in to account the rise in kvevri production as well.